There is just something about waking up early, grabbing a cup of coffee and driving to work in an open field all day. There is peace to be found in the quiet, surrounded by nothing but dirt and crops. Sure, working in the elements is not always fun, but getting dirty sure is. I come from a ranching family. Although my parents were not ranchers, the generation before them on both sides were. I’ve always been proud of my ranching heritage. Even with the blood, sweat and tears involved in farming, there is such a beauty to be found in this line of work. It is risky and never stable, but creating and growing something with your own hands, watching it come to fruition, is a rush like no other. This love for the land, for the peace and beauty found in getting your hands dirty, is one of the many connections I have with my beloved Uncle Gene. I was blessed to grow up hearing stories of his work, day in and day out on his ranches. They say you have to be half crazy to think farming is a wise career path to choose. Raising crops is a gamble, as they say, and the industry is known to be cut-throat. As my Uncle tells me, some years you can make $100 bucks selling a turd in a brown paper bag, other years you are begging to sell the most gorgeous produce ever raised, but the market is saturated with that particular vegetable. Make no mistake, I am biased as I was raised eating the freshest produce in the world. Once you eat a fresh strawberry the size of your fist, taste the sweetness of broccoli just cut from the stalk, or bite into the crunchiest grape you’ve ever had, there is no way you can go back to appreciating days old cardboard produce. When I started this blog, I knew it would give me a good excuse to pester my Uncle for a ride along day. A little bit about Uncle Gene: he is a widely successful rancher, seed producer, business owner, father, grandfather and literally one of my favorite people on the planet. He has supported me, inspired me and given me common sense advice and love since I was a child. I deeply respect him and his opinions. Plus, he is funny as hell, especially when he and my dad get together, and we all know by now I have a soft spot for funny men! His incredibly vast knowledge of crops is astonishing. I literally believe he knows growing techniques and tips for each crop grown in California. Where most ranchers specialize in one crop, he has become an expert on many. In the 70’s after receiving his degree in Math, he used the process of elimination to find out what he didn’t want to do. He realized he was not made for office work. He decided to go to work at seed companies, working for a variety of them, continually becoming frustrated by working for other people and not being able to have a say in the decisions. When the final seed company he worked for sold, he quit, feeling there was no consistency in working for someone else. If a mistake happened or change was going to be made, he wanted to be in charge of making those decisions or taking the responsibility. When he left, he told the company he would be starting his business, and they could buy seed from him. Being a strong believer in not being afraid to fail, he and a friend started A & H Farms in 1979. Realizing that if he failed, the worst that would happen is he would lose his house and have to start over. He chose instead to focus on succeeding, working 7 days a week. Every cent he made, he put back into the farm, especially farm equipment, which he says is never a bad investment. Some years were hard, other years were lucrative and helped him pay bills during the slow times. He started the North American Seed Company in 1986, and was able to buy out his partners in 1988. With hard work, time and continual profit reinvestments, North American Seed Company became a great success, with domestic and International contracts. On the day of our ride along, my Dad and I woke up early to drive from my house to the Salinas Valley, known as the Salad Bowl of the World. This has been my Uncle’s beloved home for the majority of his life. Although we arrived at 7am, my Uncle had already been awake and working for 3 hours. We grabbed coffee, hopped in his truck, and headed down the road toward the open valley and farm land of Salinas. The Salinas Valley is an interesting place. Fog, known as the Salinas Fog or Marine Layer, creeps into the valley during the night. This fog creates an overcast and cooler climate for much of the day, until it burns off in the afternoon and temperatures spike. It has been nicknamed the “Salad Bowl of the World” due to this climate, as a large variety of crops thrive in this area. The north end of the valley grows cooler climate vegetables and can do so year-round, such as lettuce, which would wilt and die in heat. This part of the valley is prime farming land, and is extremely expensive to lease or own. The farming land on the south end of the valley is a bit less expensive, as it does not provide the climate necessary for growing cooler produce. Instead, hot weather plants, such as tomatoes and peppers grow well here. It is known in the area that the Salinas Valley is an upside-down river, with the soil being made up of decomposed granite rock. About 18-20 feet below the grounds surface is an aquifer. This coupled with the cool mornings and fog, the Salinas Valley is known for its 40 inch raised beds farming method. Ranchers discovered years ago that using 40 inch raised beds is the best way to keep the base of the plant dry to prevent mold and allow lettuce tap roots to grow deep in the well-drained soil. Salinas is also deficient in sulfur so ranchers must supplement the soil to provide this key ingredient. North American Seed Company sells both large seed crops such as peas, beans, and melons, and small seed crops, such as lettuce, broccoli and cauliflower. Uncle Gene typically enjoys working with small seed crops as they are what grow best in the local area. To be honest, I had never really thought through the process of seed crops, nor did I understand the process involved. I always assumed when I drove by large crop fields that seemed past their ideal harvest time that the market must be saturated. This is not necessarily the case, as these particular fields may be used for seed. Seed quality is based on germination, vigor, and amount of seed. It goes without saying that each crop is unique with its own set of challenges. Breaking it down into categories, by large and small seeds, it helps to narrow down the differences. It makes sense that my Uncle has become an expert of multiple crops, not only based on his many years in the industry, but by the need to understand what it takes to produce good seeds from each individual crop. Upon harvest, seed can be stored. When it is time to prep the seed for germination, the seed is chilled for 24 hours to break dormancy. If the seed is too hot, it won’t germinate. Lettuce seed also germinates rapidly, so it is important to dry it out slowly. Seed is taken to a greenhouse when it is time for it to germinate and planted in seed pods. It takes about 6 weeks for seeds to grow into seedlings that are strong enough to be planted in the soil. In Salinas, the ideal time to start cauliflower germination at the greenhouse is October 1st. Around November 15th, the seedlings are prepared to be planted on the ranch. The soil is typically amended depending on if crops will be used for seed or for harvesting and selling the produce. Ranchers who produce crops to sell on the market and grocery stores often supplement the fields with nitrogen, which helps vegetation growth. Alternatively, when crops are being grown for seed, phosphorus is used. Many farmers use liquid fertilizer to assist in amending the soil and growing crops. Something else I hadn’t thought about is that liquid fertilizers can rust machines. So, special machines are typically rented and brought in to fertilize, instead of a farmer owning and therefore needing to maintain these expensive “fertilizer only” machines. All of this prep is done prior to the seedling being planted in the soil. Another interesting fact is that there are male and female crops. As the old saying goes, you can’t simply lift up a skirt to check if a plant is a girl. In the case of cauliflower, it has both male (stamen) and female (stigma) organs. Ranchers have been able to learn and schedule the best time for male and female crop planting. Typically, at least in the Salinas Valley, cauliflower is planted two rows of male plants to one row of female plants. They stagger the planting, so that they have an early and a late planted male. The early male is planted one week before the female. The late male is planted one week after the female. This helps to ensure flowering and pollination will take place and the success of the crops. When it is time to pollinate, ranchers depend on bees. Bees are vital in the continued success of agriculture! I cannot stress this enough. People do not realize how important bees are, but hopefully they will before it is too late! Ranchers import bees, typically 5-7 hives per acre to assist with pollination. Produce seems to be larger, healthier and more vibrant from bee pollination. Technology can replicate pollination, but it doesn’t produce the same results as natural bee pollination. The first ranch we visited today, owned by the son of one of my Uncle’s best friends, is currently growing mixed lettuce and cauliflower. It has been planted using seed from Uncle Gene’s company. Although half of this land is planted with crops almost ready for harvest, a good rancher knows that land must yield two crops of produce per year to justify the rent and work involved. We watched today as the second half of the land is being prepped and planted with lettuce, using a new invention and machine called Plant Tape. Plant Tape is basically strips of tape with perfectly calculated spaces between pre-germinated seeds. Fields are prepped as normal, with a disk, chisel and sub-soiler for lettuce. However, instead of a crew manually planting the seed, a machine which drives 5 miles an hour lays the tape on the raised bed rows. This incredible new technology eliminates the need for human crews to do the planting. Cost ratios are still being assessed and a few kinks such as when the tape gets However, this new machine will surely make an impact on the future of seed crop planting. During this visit, I learned that Iceburg lettuce is the most difficult to grow. Iceberg has an ideal consistency, but often that is hard to produce. Not enough water will make the lettuce hard like a baseball, but too much water will make it puffy and as large as a basketball. It also is quite susceptible to fungus. Uncle Gene said finding the right weight is vital, 24 heads of iceberg lettuce should weigh approximately 50lbs. After visiting the first ranch, we headed over to the Hess Ranch, which was where my Uncle started his business venture with his partner and dear friend Tom Hess. Back in the day, they leased the land from Tom’s mother, and worked together to create what it is today. Uncle Gene lovingly recalls some of the challenges and adventures of creating an ideal space to grow crops. He is grateful for the support and faith that was bestowed upon him and Tom by Mrs. Hess when they first started out. 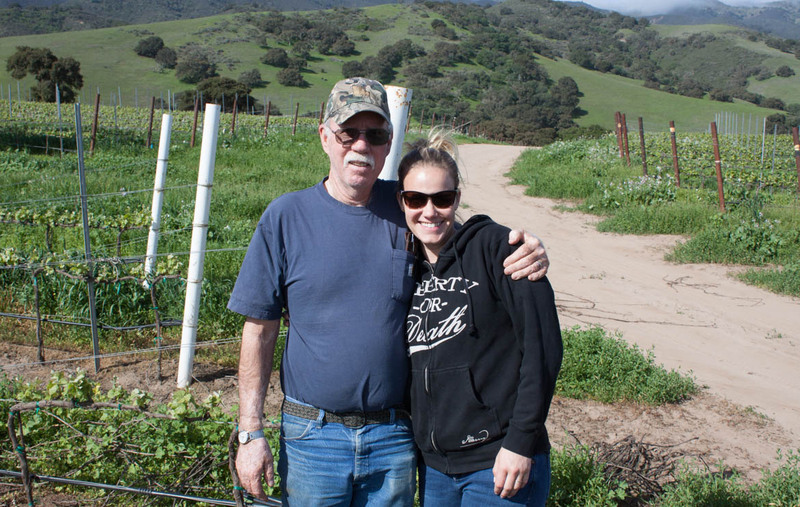 Tom has unfortunately passed away, but his son Kenny now runs the ranch, which includes wine grapes. The wine grapes have been a side investment for my Uncle, and is separate from the seed business. It has been really interesting learning both the wine maker and the wine grower’s take on the business of creating a glass of vino. Wine education will forever be one of my favorite pastimes, both in the growing and drinking of it! It is incredibly fun watching Uncle Gene in his element. All of these guys make it look so easy and so fun, but the work involved in growing and producing these crops is incredible. As a side note, if you are ever looking for a Pinot Noir or Chardonnay wine that says it comes from Santa Lucia Highlands, well…BUY IT! This is where it comes from! On our ride along today, many ranchers and crop managers we met up with were concerned about the heavy rain being forecast for the coming weekend. Each of them discussed the upcoming concern over the weather and what they would need to do in order to prevent fungus, rot and increased insect populations. It was late in the spring, and typically in California, our heavy rains are done at the beginning of March, with April being filled with mild and warm sunny days. This year, the rains and weather has been quite unusual. Many of the ranchers had planted according to typical weather patterns, but again weather is unpredictable. In the crop farming business, you have to be prepared. On this day, the ranchers were discussing the last-minute plans they needed to put together to handle this sudden rain. Some use anti-fungus sprays (organic or not, depending on the ranch), others supplement the soil. It was quite interesting listening to the different ways each rancher dealt with unexpected rain. I told Uncle Gene that I might be a basket case if I were growing lettuce, because the lack of control over my product would probably give me a heart-attack. I am SO not known for having a Type-A personality, but in this instance, it kicks in! Uncle Gene smiled and said, “Ash, the best advice I have for that worry is, it may rain. It may not rain. You should sleep at night either way, worry does nothing.” He said he spent years not sleeping at night due to the weather, until he realized that there are solutions for every problem that may arise. You can handle everything that comes your way, even if it takes a little creativity. He also stated that each year you do the best you can do. Some years even if you have the most gorgeous crops ever, the market cost is garbage because the market is saturated, meaning everyone had a great year. Other times, he said you could sell a dog turd in a paper bag and make $1,000 at market because e-coli took out a whole states worth of crops. These things are beyond anyone’s control. As in any industry, the market ebbs and flows. It’s up to the business owner to be prepared for the bad years and save during the flush years. I’ve always loved that farmers typically consider each other “co-workers”, even if they don’t actually have mutual land or crop investments. I’ve always heard of my grandfather’s comradery with the other ranchers in his area, which included daily rituals of coffee together to talk about, yep, the weather. Obviously, that was just one of the conversations held between these friends. The joke is that they would daily solve world issues before going back to their own corner of it. I find so much joy in communities coming together to support each other, and this ranching group is no different. Everywhere you look while driving along the Salinas Valley there are ranches, crops, barns and rolling hills in the distance. It is fabulously serene if you love wide open spaces. I can absolutely see and understand the beauty of working here. While we were driving around Uncle Gene stopped the truck at a field of broccoli. There were harvesters and a crew working about 100 yards away from where he parked the truck. He said, “Ok, time to steal dinner! This is my favorite treat!” He grabbed his pocket knife and hopped out of the car hollering “Don’t go callin’ the cops on me!” My Dad and I busted up laughing as he started cutting stem after stem of broccoli and tossing it into the truck. The people on the harvesters just looked at us but kept working. I thought oh crap, my beloved Uncle Gene is a CRIMINAL! Little did we know that he had received permission to pick it from his buddy that morning! He got into the car and started stripping the broccoli trunk down to its core, where he cut it into bite sized pieces. Handing it to us he told us that fresh broccoli is one of the sweetest vegetables there is, and one with fabulous flavor. I’ve had broccoli before (obviously) but until that day never really thought of it as sweet or flavorful. It was amazing! He said as is the case with any other produce, the longer it sits, the more the fresh, sweet flavors disappear. As we were driving through the valley, it was interesting to see the different crops raised in this area. We stopped at quite a few places, including a cactus ranch, which Uncle Gene said he would never get in to, because even an experienced rancher doesn’t like dealing with pricks! Along the drive, Uncle Gene also pointed out “bad” crops, some that seemed to have black rot, and others that just seemed wilted. I asked how he knew which was a man-made issue and which was nature based. He stated that man-made crop issues are always linear, usually affecting whole and straight rows at a time. Nature based issues are irregular and have no pattern associated. If plants have black rot, it will show first on the north side of the field and move across the crop. Don’t be afraid to fail or take risks. Calculated risks of course, but don’t be too scared to act. You have nothing to lose when betting on yourself. Farmers must love to get dirty. He’s been told more than once that people have never seen someone love getting dirty as much as he does. The key to success is getting out in the dirt to get something done. Amen to that! Never let anyone else write business checks on your behalf. Never leave on vacation and not return phone calls. It’s ok to take a weekend break, but a formerly successful Salinas rancher took a month long out of state vacation and refused to answer his phone. The day before he left he signed a multi-million-dollar contract. About a week into his vacation the company with the contract tried to get ahold of him a few times with a minor question. Since he did not respond, they ripped up the contract. Absolutely go on vacation, but just make sure you can check in from time to time! Lease to own farm equipment. Putting money back into equipment to use on your ranch or farm is always a good investment. Don’t live loudly and lavishly. He said it is not anyone’s business what you make or what you can/can’t afford. There is no need to drive fancy cars or wear labels, especially when starting out. It’s more important to be able to make it through the tough years financially. After lunch, we took the backroads home, stopping off at some of the same ranches to see how the plant tape machine was doing. Man, that machine sure gets it done! During the time spent with my Uncle, a few things stood out clearly. First, he is very well known and respected in this area. From each person at the ranches we visited, to people walking through town at lunch, my Uncle was greeted with a genuine, friendly hello and big smile. To me, this speaks volumes of his character. He is extremely knowledgeable in this industry and has worked tirelessly to succeed. For some, this would make them arrogant, but Uncle Gene is anything but. If a friend or rancher needs help, he will be there, in the dirt or mud, no questions asked. He is humble, devoted to his family and passionate about the land and the life he has created for himself. I am proud to call him my Uncle and to be able to see the behind the scenes view of this world that so many people are unable to experience. Now, let’s hope he lets me ride along and “steal” more broccoli again in the near future! Thank you for sharing this! An absolutely wonderful article highlighting your day and insight into this farmer’s company. For the food we eat, “Thank a Farmer” is so fitting! He is an amazing man, as you well know! <3 Thank you for the constant love and support! This is beautiful! I cannot wait for the next featured farmer. Thank you my friend, that means so much to me! <3 Thank you for the support! Perfect pick for the first Featured Farmer. Love, Love Uncle Gene he is the best. Thank you for digging into the soil for us. I couldn’t agree more!! <3 Love you!